Obama fought Congressional Democrats today in his Republican-aided crusade to pass the "Trans-Pacific Partnership" legislation. The contents of the legislation are secret and unknown to most members of Congress. For all they (and we) know, the contents could well be treasonous and destructive to America. This possibility normally does not stop our overlords from passing new legislation, but for some reason Obama's own party seems to have "grown a pair" and is obstructing the legislation. Kudos to them, and a pox on the Republicans who by supporting Obama have shown that they care nothing for principle. The weather against the US Sibley chart today is interesting. The focal point today is the US Mars in Gemini in the Seventh, suggesting action and/or communication regarding foreign entities. 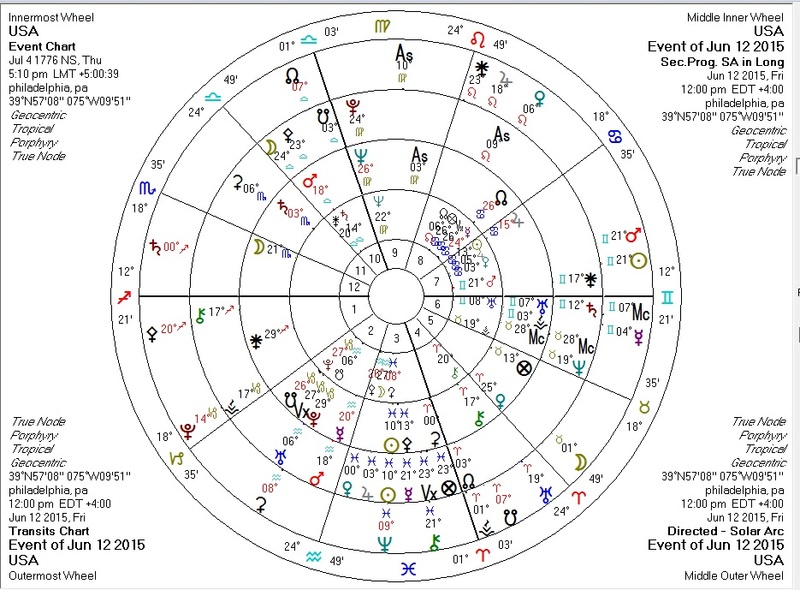 The transiting Sun and Mars are conjunct the US Mars today, suggesting much action and/or a fight. This is much exacerbated by transiting Pallas square transiting Chiron, suggesting ethical difficulty, which with the US Mars and transiting Sun and Mars form a tight T-square. Transiting Venus is conjunct the US North Node in the Eighth, suggesting that financial destiny is highlighted today. The transiting South Node in the US Fourth House is trine the US North Node in the Eighth and transiting Venus, suggesting that something may be lost, possibly by Eighth-House corporate financial forces and the like. Of course, Pluto is still opposite the US Sun and progressed Jupiter (the Ascendant ruler). Big changes for the US may still be afoot. Because the contents of the TPP are secret, we can only speculate.